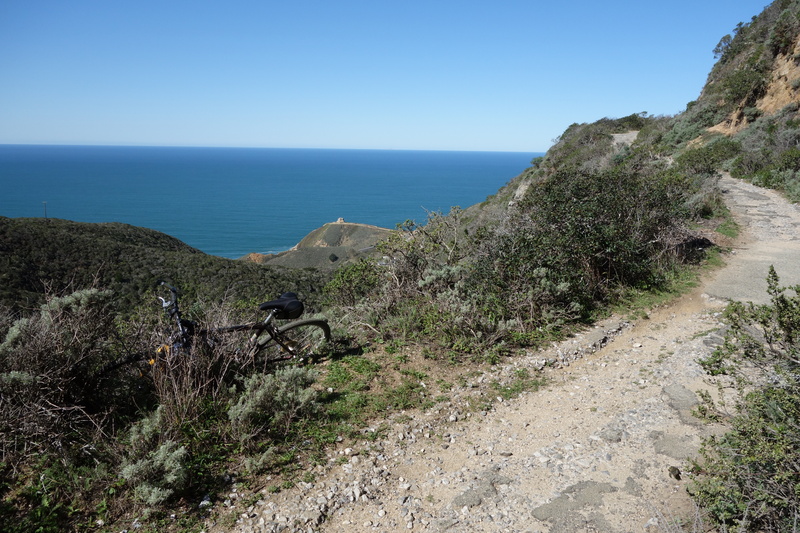 Old Pedro Mountain Road overlooks the Pacific between Montara and Pacifica. Old Pedro Mountain Road summit looking north to Pacifica. Is it possible that Global Warming has forever changed Pacifica’s weather from foggy and damp to sunny and insanely nice? Sunday’s ride made me think so. On top of the sunny skies, Frank-Sinatra-blue-eyes Pacific and rugged hills, there’s the Old Pedro Mountain Road rolling over them, one of the finest multi-use trails this side of Paradise. On today’s ride I set out from the seaside community of Montara and headed across some brief single-track in the Golden Gate National Recreation Area before finding the road and beginning a long but not-so-steep climb to the summit where there’s a view of Pacific and — just barely visible in the distance — the red spires of the Golden Gate Bridge. 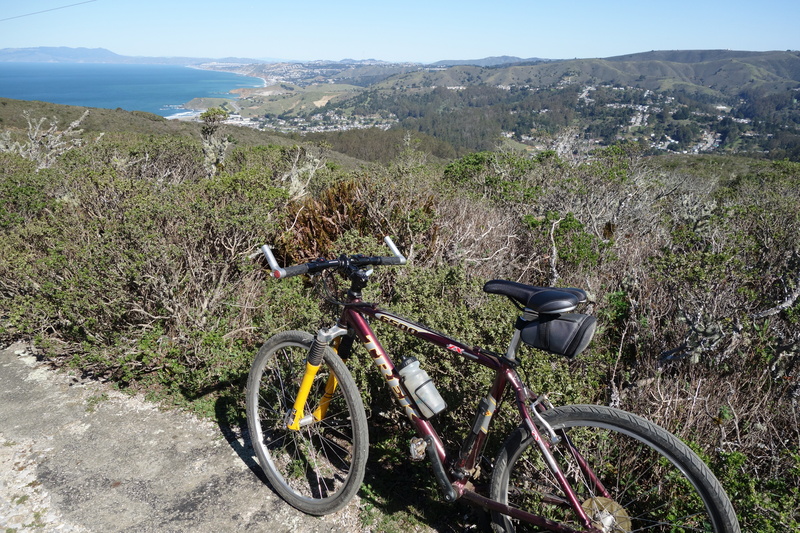 I’m told there are miles and miles of trails running along the coastal hills between Half Moon Bay and Pacifica. If access to the San Francisco watershed ever becomes a reality, this slice of the Pacific coast will easily become one of the finest recreation areas on planet Earth. I’m not exaggerating. 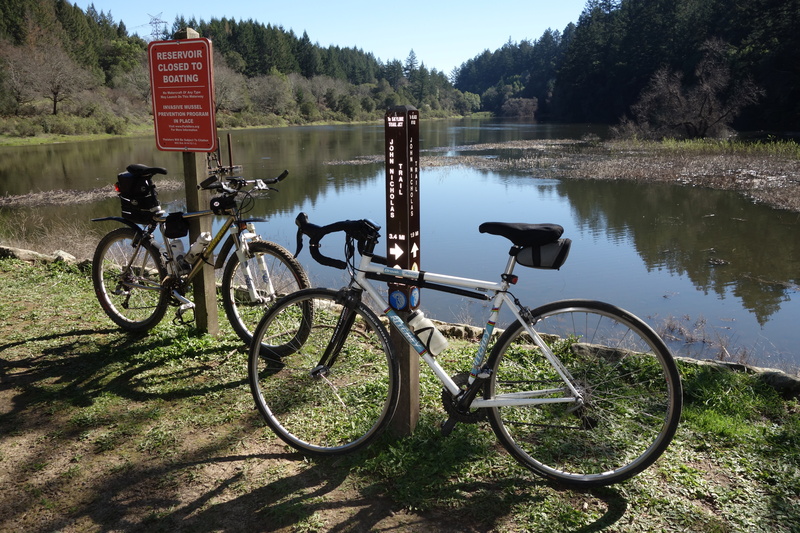 Lake Ranch Reservoir in Sanborn Park. It’s so, so, so legal for bikes. This entry was posted on February 22, 2015 at 5:08 pm and is filed under Ride reports. You can follow any responses to this entry through the RSS 2.0 feed. You can leave a response, or trackback from your own site. Good to be out there with ya Ray!